The Autostrada del Sole is transformed into a green parkland that activates a series of plug-in valleys for the cultivation of bio-fuels and the development of new agrarian and post-industrial communities. The existing viaducts and the surrounding hills are transformed into a series of landscaped parks with areas of cultivation. 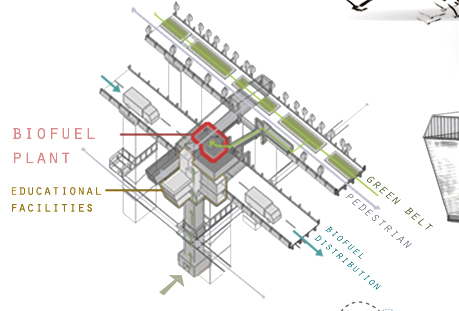 Tunnels become sources of geothermal energy providing heating and cooling to the new communities. Each viaduct is adapted to support plug-in structures that make vertical connections to the valleys below. The new structures form a conduit for processing bio-fuels and other agricultural products as well as providing facilities for hikers and visitors to the park and for research communities. 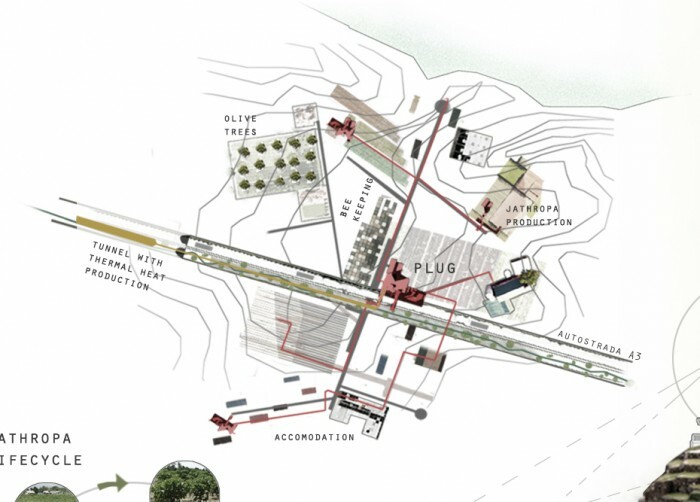 The plug-in structures are informal kit of parts, acting as agricultural machines for the harvesting of bio-fuels from the valley below as well as housing educational spaces and events promoting ecological living and the wider region of Calabria.